So, returning to the US at the beginning of November, where, while it wasn’t yet cold, the ground was starting to harden, and nothing was growing anymore…was a bit of a letdown. While it was nice in some ways to get back into the swing of things at the hospital, the 12-hour days indoors under florescent lighting were a tough adjustment. I felt as though I were going through withdrawal. Therefore, I started researching organic/permaculture farm volunteer opportunities in Central & South America. I only had a little over a week available, but I decided to go for it. Good for people + good for the environment + sustainable + sharing the surplus = Permaculture in a nutshell. 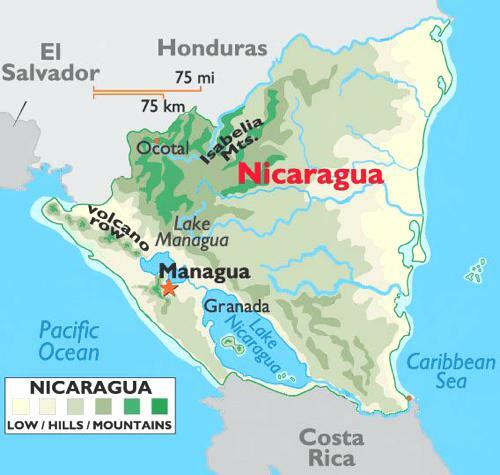 Did you know that there is a large lake in Nicaragua, aptly named Lake Nicaragua (or Colcibolca), upon which is a double-volcanic island? Now you do. The finca (farm) was located just outside of the town of Balgüe on the dormant volcano, Maderas. To get to the farm, I flew into Managua, spent the night at a nearby hotel, then took a taxi-bus-motorcycle combo to the port, where I then hopped a lancha (small boat) to get to Omatepe. From there, a shared bus to Balgüe, then a lovely 15 minute walk up to the farm. The path up to Finca Bona Fide. Being that the finca is located on a volcanic island, the soil is especially fertile for farming. Volunteers come and go frequently at the farm; during the week I was there, there were about 10-15 short & long-term volunteers. Volunteers live in one of several open dorms on bunk beds covered in mosquito netting. There is solar electricity, and no refrigerator. For bathrooms, there are open-air sinks, compost toilets for #2 (you pee in the forest) and several open air and bamboo showers. It is a bit of an adjustment, but overall pretty great to be outside. The “Parthenon” dorm where I slept. One of several compost toilets. Volunteers work on the finca Monday-Friday from 7am – 11:30am. We break at 8am for breakfast and for lunch around noon. Where the food magic happens. Have you ever seen more beautiful salad greens? Meals were like an episode of “Chopped”, with a variety of ingredients to be combined in any creative way. Always involving gallo pinto, though. And always delicious. The type of work depends on the season and the needs of the farm, but is broken down into areas such as: feeding the chickens, preparing meals in the kitchen, watering plants and planting in the nursery, harvesting fruits and vegetables, working in the garden, composting, transporting straw or logs from the field for various projects, etc. As the Permaculture Design Course was to take place the following week, the field team constructed a women’s urinal one day, and another day fertilized trees with “humanure” — human compost that had been drying for over a year in the compost toilets. It looked and smelled just like plant compost by this time, thankfully! Off to find termite nests. Hacking a termite nest for the chickens’ breakfast. The chickens were quite pleased. Afternoons and weekends are free to chill, explore the island, or to get involved with other farm activities and projects. Fishermen & the ever-beautiful Volcan Concepcion. As it was the weekend, most of the volunteers/staff had gone hiking up the active volcano, Concepción, that day, so I joined them when they returned for dinner, at the home of their famous head cook, Marina. She is trying to raise money to send her daughter to nursing school, so we all chipped in for what turned out to be a FEAST- chicken, plantain treats, gallo pinto & rice (of course), fries, & freshly-made guava juice…then fresh banana smoothies, homemade cocoa-chili treats, and these amazing pancake-like creations with REAL CANADIAN MAPLE SYRUP (a gift from a previous volunteer) for dessert. We were all in awe. And so contentedly full. It was a good first night. Thank goodness we feasted that evening, as the next morning, I set out with only three tiny bags of peanuts and one smushed banana (the shops weren’t open early enough) to hike the dormant volcano upon which the farm was located, the Volcan Maderas, which is an 8h hike (versus 12 for Concepción). I set out with Felipe, the husband of Marina, and his teenage daughter and friend who had incredibly never hiked it before. As the girls immediately sped ahead, I wondered whether we were walking too slowly, but Felipe just chuckled. Soon, the girls were gasping and sitting down whenever a rest spot appeared, as the hike rapidly became vertical through the slippery rainforest. We passed coffee plants and cacao trees, and watched as the muddy clay turned from yellow, to orange, to red. About 1/3 of the way up, we came to a beautiful lookout point, over Lake Nicaragua and the Volcan Concepción. As we continued, the hike became SO muddy that we were pretty much wading through ankle-deep mud. Much slipping & laughter ensued. Finally, we descended into the crater, known as “the lagoon”- AKA: a pond. Yet it was cool to be in the center of the volcano. We stopped to eat our lunch (in my case, the final bag of peanuts), and watched the antics of a group of teenage boys- they had hiked the entire way just to play football in the crater- and put on quite a show. I will not go into the details of the hike down, but suffice it to say- if there had been a cable car to the bottom, I would have taken it. Hiking for 4h down a VERY slippery, VERY muddy mountain with almost zero food…not ideal. Dinner that night, however, was SPECTACULAR. The next morning, we started our workweek at the finca. We harvested a variety of fruit, and learned about how when harvesting bananas, the tree must be completely chopped down to ensure the water and nutrients go to the young banana trees. Jeannette machete-ing fruit like a boss. We also harvested some giant jackfruit, and got to process them- the fruit is interesting, but the seeds are especially delicious when boiled. My mum just brought one home from the supermarket, so apparently they are becoming a thing here, too! Harvesting the E N O R M O U S jackfruit. Processing jackfruit. Sooo much latex. I don’t think I had enough time to pick a favourite area of the farm, although I was most interested in the garden. Lauriane & Farah prepping a new garden plot. Scraping the bottom of the well after emptying it with the morning’s watering. After work, we’d walk down to town via the shortcut to grab one of Balgüe’s famous smoothies or brownies, or for pizza night at Zopilote’s (40 min walk). It was nice to walk everywhere. Even though only a short trip, it was great to be with a group of lovely people who care about the environment and sustainability, and about working together to help the finca run well. I only wished I had had an extra week of holiday to have come for the Permaculture Design Course the following week…but shall have to save that for a future date. Nevis teaching us how to make a natural insecticide, with neem, sorillo, and hombre grande. Post Script: That Time I Almost Died.